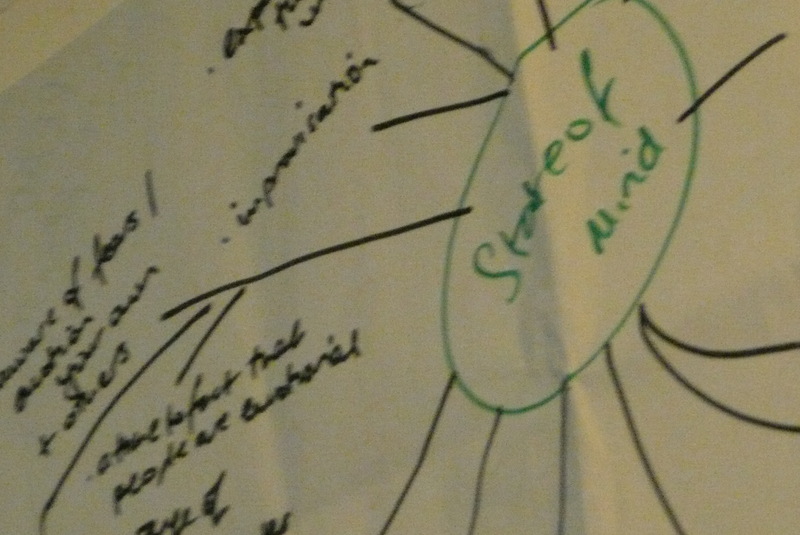 State of mind covered two broad concepts – multiple perspective and issues of impartiality and judgement. Using a simple example of imagining the colour blue, we looked at how words form different impressions and/or images in our minds; and extended this concept to think through how our own thoughts about what we hear may be different to what the intended meaning was and the consequences for working with others and their disputes. I also worked with the group to understand that it’s useful to differentiate between what you perceive, what others are perceiving (and the obvious need to check this out) and what an observer might notice. Looking at impartiality and issues of judgement, we acknowledged that our sub-conscious processes militated against an ability to be completely non-judgemental or impartial. But recognised that an awareness of what we’re thinking and how we’re acting can ameliorate this and its effect on people we’re working with. In short we can aspire to becoming non-judgemental in the role of mediator, but should retain the humility of understanding that we can’t be. We looked at each of these, but focused on the first block; as my experience is that this block is the one that is the most absent from our socialised way of communicating and therefore needs more active work in learning. And it throws up how people’s desire to share their solution or idea can undermine their attempts to be ‘impartial’. The likelihood of their being asked to be a 3rd party neutral was slim, but in their jobs it was apparent from the examples they gave that the skills could be applied to different circumstances – internal team disputes, disputes among local groups and acting as peer mediators for other organisations in the network. We then spent some time discussing how the skills could be applied to these different situations. We concluded by thinking through how we could deliver a deeper two day programme in conflict resolution skills that would develop the core skills and look at how they can be applied to people’s needs in their roles in NGOs and campaign groups. Let us know if you’d be interested – the cost will be (hopefully) below £100. We’ve often commented on venues and other practicalities in our blogs on the work we’ve done. Carl ran his session at WDM’s office near Oval, south of the river in London. They now have a top floor meeting room for public use. It’s a nice space, big enough for a small to medium size group meeting or training session. The big downside is the 3 flights of stairs (no lift). Thanks for a good session, although I agree compressing 5 days worth of useful material into 105 minutes is never going to be easy. I’d be keen to do something as detailed, so perhaps 5 days, but based on not just independant/transformative mediation but also with some aspects of the power structure that we as NGO staff operate in. Richard – I trained the courses at Camden both before and after they went down the transformative route. Personally, I think there are different approaches and it’s best to be eclectic. And I also know at least one of the activist mediation network as I trained them too – back in the mists of time.